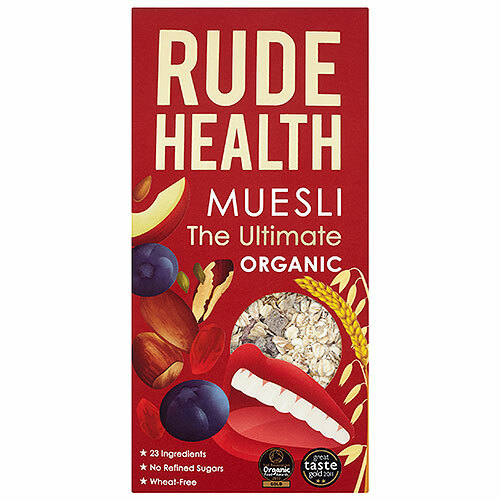 Why make a muesli with 23 ingredients when most have fewer than 12? Because it means that every spoonful is different. Sometimes you get some plump blueberries with a bite of Brazil Nuts and Almonds. Sometimes you get soft Apricots and tingly little seeds. Rude Health even made the grains interesting. There`s no wheat, just Quinoa, Oats, Rye and Barley Flakes to make it light and crunchy. After this, other breakfasts are going to seem a bit dull. Oats, Rye Flakes, Raisins, Sultanas, Barley Flakes, Apricots, Almonds, Brazil Nuts, Dates, Golden Linseeds, Pumpkin Seeds, Sunflower Seeds, Cranberries, Quinoa Flakes, Apple, Buckwheat Flakes, Goji Berries*, Hazelnuts, Puffed Rice, Blueberries, Poppy Seeds, Linseeds, Cinnamon. *Approved non-organic ingredients. Enjoy at breakfast with organic milk. 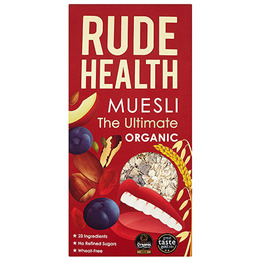 Below are reviews of Rude Health The Ultimate Muesli - Organic - 500g by bodykind customers. If you have tried this product we'd love to hear what you think so please leave a review. This is my first time trying this brand it's nice I have it with Almond or Oat milk.